We haven't yet decided what sort of farm venture is going to be profitable for us, but we are well on our way to figuring it out. What we have realized is that with only 50 acres, cattle are not going to be suitable for us in terms of profitability. So the cows had to go. We have been fortunate to sell the girls to various cow calf operations, and the bullock to a new herd where he will be a herd sire. 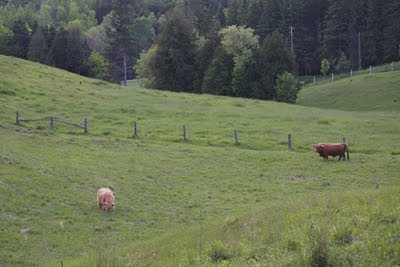 That leaves us with Monty, our bull, and Kelda our favorite girl. For now, they can roam the hills until we determine if they will have a permanent spot on the farm or not. My dear sweet man is quite enamoured with them, and I figure if I have my donkeys, then he is allowed some bull!